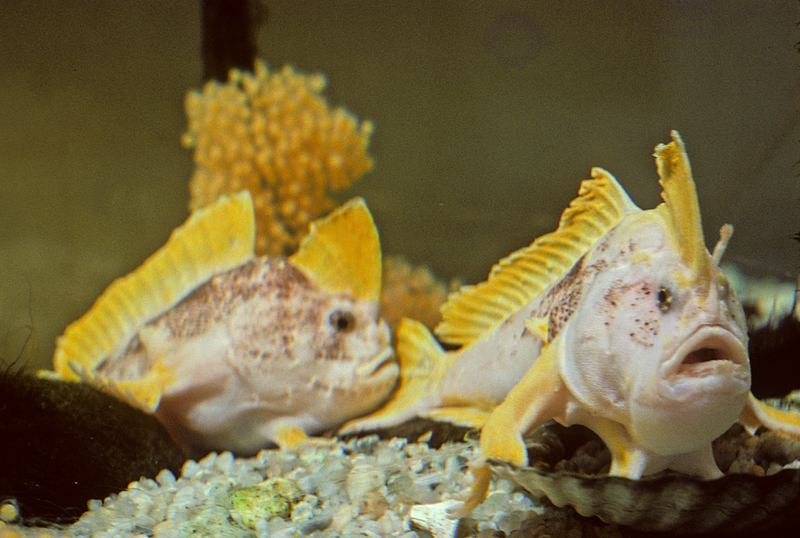 Alas, Handfish care nothing for our fishy expectations. "Pish-posh!" they say, waving a hand in derision. Probably. And they look so cute while they do it! They're certainly a lot cuter than most of their relatives. 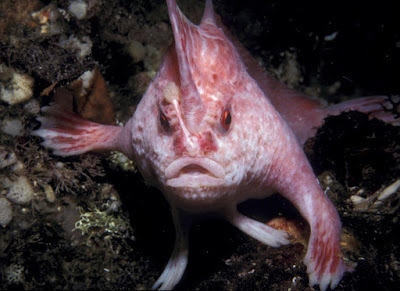 Handfish are a family of anglerfish, related to ogrish Monkfish, cute-but-infuriated Frogfish and all those devilish Deep Sea Anglers. The Handfish family is called Brachionichthyidae, which means 'arm fish'. It refers to their hand-like pectoral and pelvic fins which they use to walk around on the seabed. They can swim when they want to, they just don't often want to. Until recently there were just four described species of Handfish spread across two genera. They're all a little more or little less than 10 cm (4 in) long and, unlike a lot of anglerfish, they actually enjoy a diet that befits their size. A 10 cm Frogfish, for example, would gladly eat something about, say, 10 cm long (show one a mirror and it'll probably try and eat itself), and don't even talk about those Deep Sea guys. Handfish on the other, er, hand, prefer to nibble on small fish, worms and crustaceans that don't require an elasticated stomach to keep down. 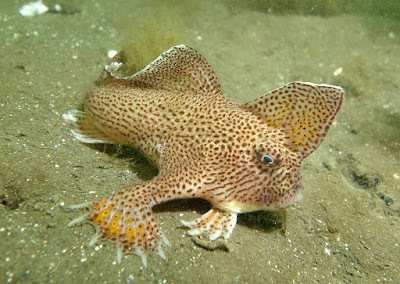 The most famous Handfish of them all is the Spotted Handfish. It's found only in southeast Australia, specifically southeastern Tasmania. Even more specifically they live in the estuaries and surrounding bays where the River Derwent meets the sea. That's very specific, indeed. It wasn't always known that the Spotted Handfish had such a tiny distribution. 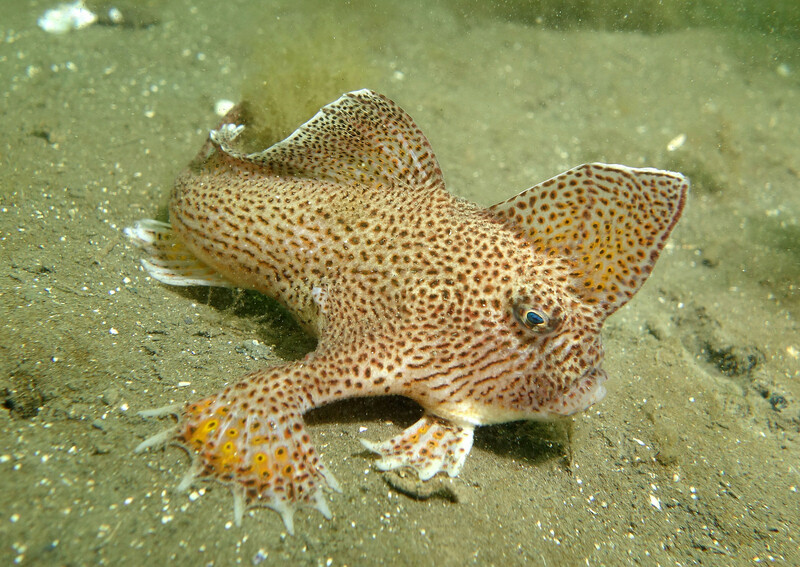 It was once thought to be quite widespread along the southern and eastern coasts of Australia but then, in 2007, they discovered that the Spotted Handfish wasn't a Handfish at all. There were two of them! 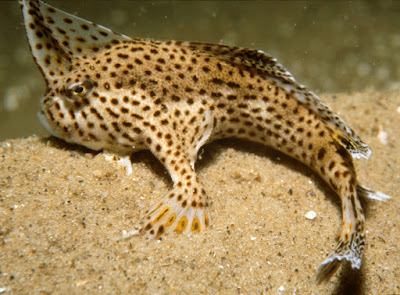 The new, more widespread species was called the Australian Spotted Handfish. 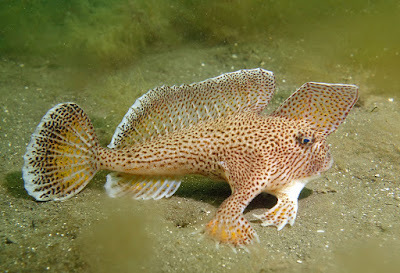 Which is odd since all Handfish are Australian, including the Spotted one. Discovering a new Handfish is cool and all but it was nothing compared to what happened in 2010. That was the year when some scientists rolled up their sleeves, consulted the yellowing pages of The Literature, and examined the contents of formaldehyde-filled jars bequeathed to them by their ancestors—they undertook... The Revision (pdf). As it turns out, there's a HUGE amount that is completely unknown about Handfish, a lot of research that hasn't been done. People knew for a long time that there were more than four or five species, it's just that no-one had formally described any of the others. That changed in 2010, when another NINE species were described and three new genera erected. 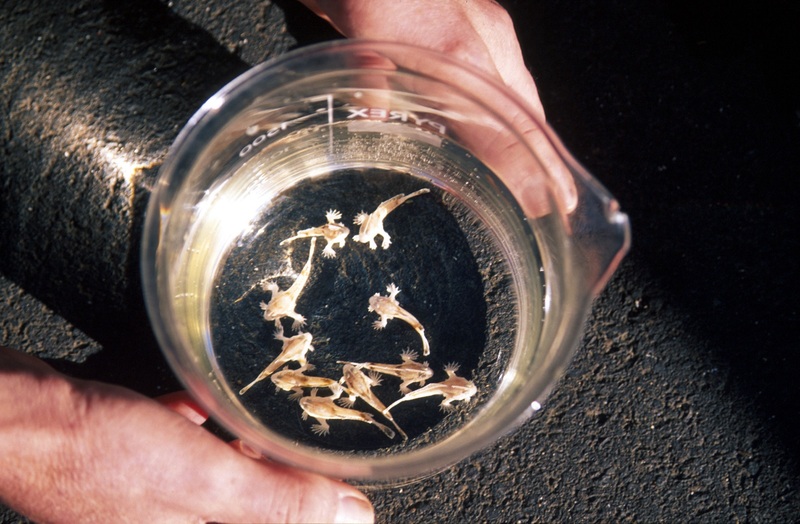 Some of these new Handfish are pink, some are white with yellow fins, some are less than 5 cm (2 in) long, one is known from just a single specimen, several others from little more. Tasmania remains Handfish Central, with all but three of the new species living off that island's coast. 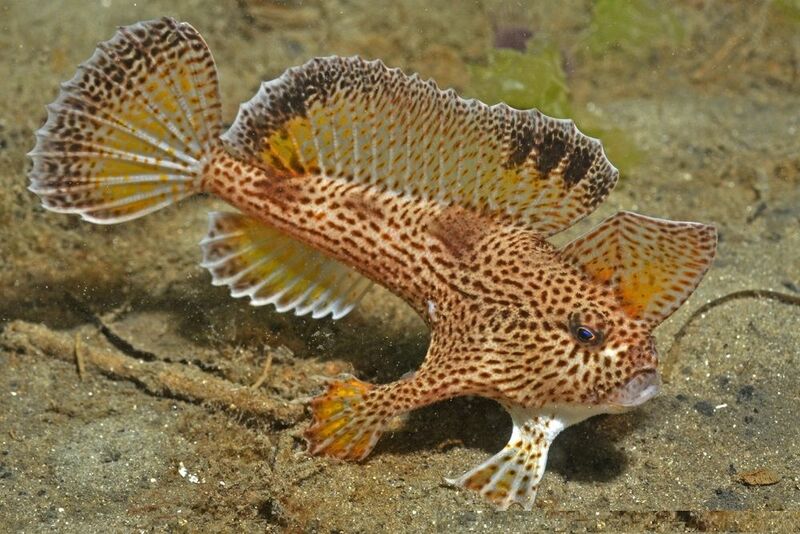 As you can see, Handfish are real homebodies. They have their base of operations and they seem quite content to stay put. 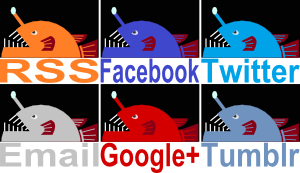 I suppose that makes sense if you're a fish who walks on your hands and doesn't like to swim. But there's something else. Something that Frogfish have which Handfish don't. Something that even starfish and oysters have which Handfish don't. And that's a planktonic stage. Spending a bit of time as a tiny speck of plankton adrift on the current is a fantastic way of getting around. Maybe someone should have told the Handfish? While we can't say for sure with all species, we do know that the drifter's life is completely foreign to the Spotted Handfish. Image: Mark Green, CSIRO Marine Research. Spotted Handfish lay their eggs around some kind of vertical pole, like a large sea squirt or some sea weed. 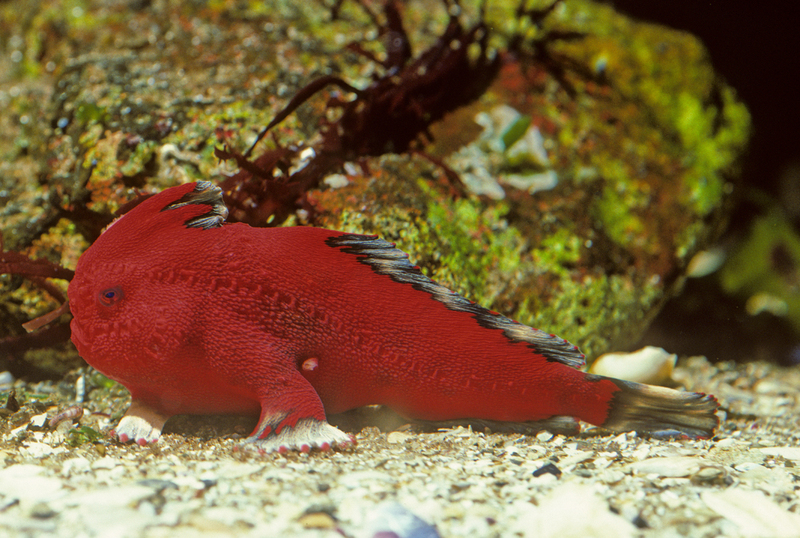 The female lays about 80 to 250 eggs, which is basically nothing compared to Frogfish who can lay more than 100,000. She guards them for seven or eight weeks before they hatch and lots of tiny miniature Handfish emerge. They're about 6 or 7 mm long, which is certainly very small, but it's a lot bigger than a newly hatched Frogfish who might be closer to 0.5 mm. 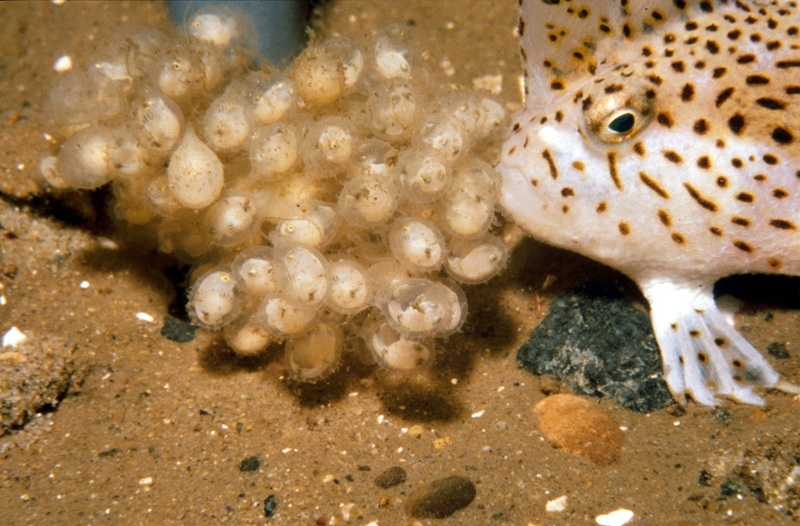 The baby Handfish would definitely win in a fight, except that the baby Frogfish could easily escape by simply drifting away to leave the poor Handfish landlubbing on the sea floor. This inability to get around means that Handfish populations have been particularly hard hit by pollution, trawling and dredging. Conservation efforts are on-going and we can only hope they'll be successful. It's likely there are even more species out there, as yet undiscovered, and who knows? Perhaps one day they'll grow feet? Hey, I think these guys might be able to take on those angry birds! If we could get them together in the same element. We need some tiny diving suits and land suits! Even better than feet, perhaps they'll grow opposable thumbs! They could use tools. I'd love to see that! Why should I care? What do they do for the environment?